Sonia Green is a bit if an enigma. On the surface this Jewish émigré from the Russian Empire seems an unlikely match for the master of horror. Seven years HPL’s senior, she was defiantly the instigator of this relationship, and apparently the only woman Lovecraft ever kissed as an adult. But who was she? How did they become an item? And what happened to Sonia Greene after she separated from Lovecraft? To start off I want to quash the rumor that Sonia Greene was ever romantically linked to the occultist, Allister Crowley. There is no evidence that they ever encountered each other. In 2007 Weird Magazine on line, did a bio piece that included this. Now the line about Sonia hooking up with the self-proclaimed Anti-Christ has been struck out. Sonia Greene was born now in what is called the Ukraine. A member of Jewish family. When her father died her mother immigrated to America. At sixteen she married an abusive and violent man who killed himself. The relation produced one surviving child, a daughter, the journalist/biographer Carol Weld, who Lovecraft had little to so with and moved out of her mother’s house when she was seventeen. In a lot of ways Sonia Greene was living the American dream. 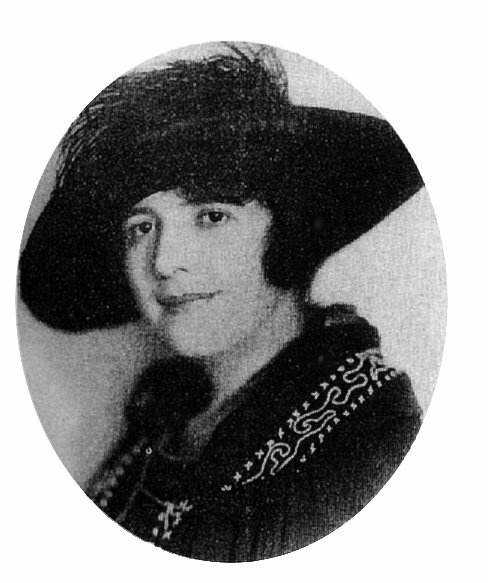 She owned a successful hat shop, and had a modicum of local fame as a designer of women’s hats. This allowed her a surplus of income that she could become a patron of armature writer associations. This is how she met Lovecraft. Some have even gone as far as describe her an amateur writing groupie. It would make sense that she was smitten by the East Coast’s armature writing circle’s rising star. It should also be noted that Lovecraft met Sonia, three weeks, after his own dominate mother had died. She probably died from being exposed to syphilis from his father. He may have been looking for an older female figure to replace his late mother. Her death possibly from a sexually transmitted disease might have also set the tone for intimate relationships. Their marriage was not based on passion. But this was the 1920’s, a marriage based on common interests, being able to communicate with each other, and financial stability was much more common than today. A marriage that did not originate out of blinding passion was not that uncommon. The account of Lovecraft’s first adult kiss is actually a romantic story. Sonia and Lovecraft were strolling one night by a lake, when they heard some kind of loud snap, probably caused an animal of some kind,. Panicked she jumped into HPL’s arms. After the immediate panic subsided, they began to laugh about it. She suggested that he write a story based on the experience. He chivalrously suggested she should pin it. As a reward she gave him his first romantic kiss. The story that was inspired by that night is The Horror at Martin’s Beach. This is one of my favorite Cthulhu Mythos stories. It was first called The Invisible Monster, and on occasion is credited as Lovecraft tale. There is no doubt though he only edited it. Writing is going to be center of their relationship. On their honeymoon, Lovecraft looses his copy Under Pyramids. So he spent his honeymoon dictating the story to his new wife. The marriage for the first years by all accounts was good. But Greene suffered a setback and had to close her hat store. Both Lovecrafts suffered a bout of ill health. Sonia felt she needed to move to Cleveland and Lovecraft refused to move from his beloved east Coast. Eventually Sonia moved out west and HPL was taken in by his aunts. The Lovecrafts agree to divorce. Though despite his insistence HP never submitted the finial divorce papers. Sonia marries a doctor and moves to California. She loses contact with HPL and is not informed of his passing until eight years after his death. At this time she discovers that their divorce is not official and she was a bigamist. This devastates her. So why did Lovecraft not make the divorce official. To best of my knowledge he never wrote or told anyone about why he didn’t follow through. Was it because he still loved her? Was he just lazy? We will never know for Sure but to me maybe it shows how much he truly did love her. Lovecraft is one of those people I’m very torn on. While he’s the father of horror and his stories are the foundation of so many modern narratives still, he was a horrible racist. I do believe you can glean the good from the bad, and no artist should ever be summarily dismissed, but their viewpoints must still be taken into consideration for certain points. Very good point, I have the same feeling about Kipling who I love his work but it is pretty heavy on The White Man’s burden. I think you can loathe the attitude an artist had on subjects but still respect his work. Yes! I’m very fond of The Jungle Book, but Kipling did have very problematic views like Lovecraft. This entry was posted on October 1, 2015 by davekheath in Uncategorized and tagged Horror, Lovecraft, stories, Writers.